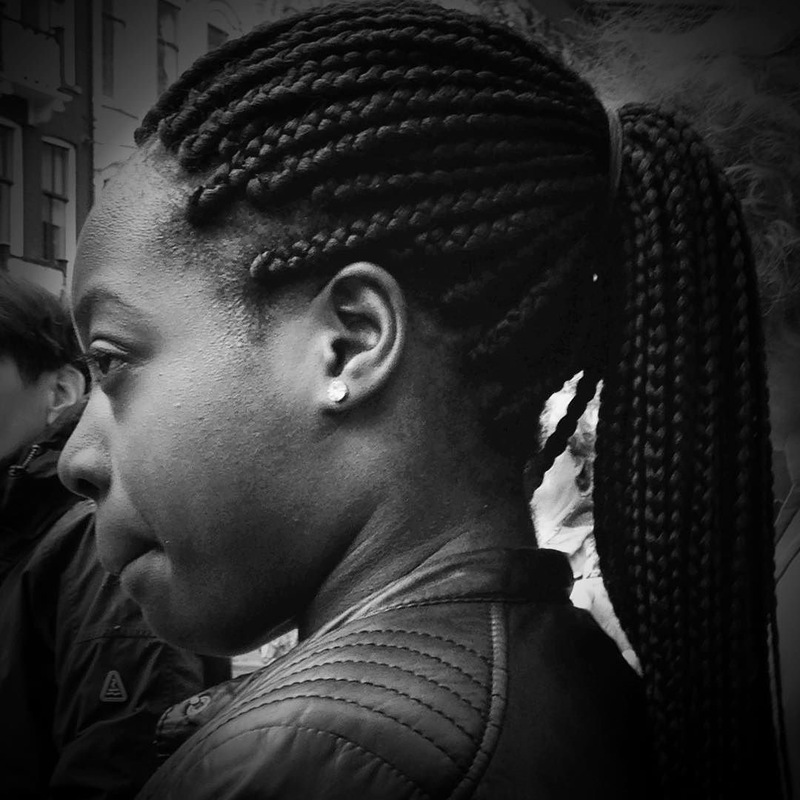 These are candid shots made in the streets of Amsterdam. Phographically speaking , they are all very creative and perfect for the theme…. Personally , my preference goes to the first photo! It’s my preferred too! Thanks! I was so happy when I saw you’d done more portraits, Lucile. I especially love that first one. You’re such a great supporter, Janet. Thank you so much. Portraits are a particular challenge and you have managed to give us a strong portrait with an aesthetic touch. The second has such contrast, and we can appreciate the details that monochrome can give. Happy Photo Challenge. Sally, I’m overwhelmed. Your opinion means a lot to me. Thank you. Thank you so much, Gun. The first photo is beautiful. The black and white treatment really works with this image. Suzanne, thank you so much for the considerate comment and for visiting the blog. that busstop shot sure is a sign of the times! nice clipped lines emphasising the disconnect. I can make the same kind of shot every single day! Thank you Debbie!! The first one is beautiful. The second one, it’s sad. It’s not your photo that’s sad, it’s the gadget use. Thank you Amy! You would be sad to see a photo I got this weekend from a friend, who was visiting a museum in Amsterdam. There were around 20 kids looking at their smartphones, whilst being in front of the most famous painting of Rembrandt, The Night Watch. Bizarre but a common sight. I like that title – Disconnected! Perfectly said. Thank you so much. Also for dropping by. Wonderful street photography, Lucile. I love them both; the first is very dramatic, and the second really gives us a slice of life in Amsterdam. Hi Angeline, thanks for dropping by. Your comment is much appreciated. Love these. The second shot could stand as a symbol for life in a public space anywhere these days. Wonderfully captured! 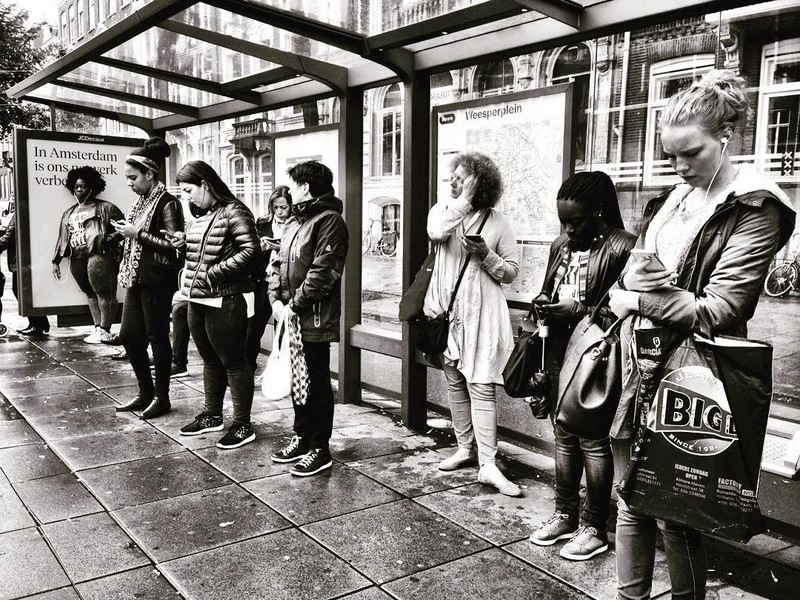 I love dis-connected, I do have a thing for bus shelter shots, mobiles, and of course your portraits! Haha We’re buddies! I sometimes miss the tram just to not miss some shots. Great fun, isn’t it? I love that first portrait, Lucile. Great angle and texture of her skin. Thank you, Patti. It was a great surprise that it turned out well. I was very close to her trying to make candid shot, and hoping not to be noticed. I had only one chance to shoot and hoped it would be sharp.